The brief from the directors was clear: PHOTOREALISM. A word that sends a shiver down the spine of even the most seasoned CG veteran (perhaps especially so the more seasoned). "We want it to look as though it's all been made in someone's basement - someone with a lot of time on their hands - and then lit and photographed by an absolutely top-notch miniatures photographer." I think we were all initially thinking "It's plastic - how hard can it be?" Well.....hard.....very hard. Let's leave aside the technical considerations (the subject of a future article) and consider the cinematographic challenges. Pretty much everyone is familiar with Lego. We "know" what it looks like - how it reacts to different lighting conditions, the patina of its surface, the way light transmits through it. So to represent Lego photorealistically via computer graphics is most unforgiving - the slightest mistake will just look wrong, and almost everyone will react to the mistake, even if they could not articulate what was wrong about the image they were viewing. Scale - how miniature should the world feel? Can we retain a sense of the epic while evoking the tiny? Light in a Lego World - How can we make people believe that this Lego world was actually constructed from real plastic bricks and photographed? How does light of various intensities and hardness react with Lego? What about coloured light? Grant spoke to Lehtimäki, who revealed that one of his influences was the work of Douglas Trumbull, the effects legend behind films such as Blade Runner and Close Encounters of the Third Kind, amongst others. One of Trumbull's signature approaches to miniature cinematography was the use of "smoke tanks", using a very high density of smoke in the room in which the miniatures were filmed to help separate elements and enhance the sense of scale. 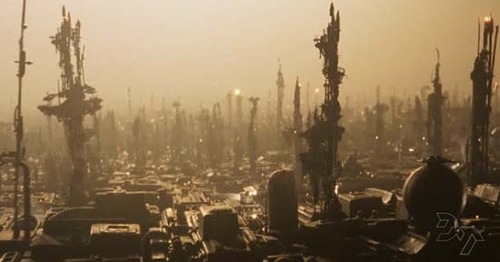 (There is an interesting video on his website in which Trumbull explains the miniatures work done to create the "Blade Runner Hades Landscape"). Avanaut says he calls his own technique "Forced Atmospheric Perspective Photography". Grant and I were not exactly averse to the heavy use of atmospheric smoke and particulates, as evidenced by the work we did on "Legend of the Guardians", so it felt natural to embrace an atmos-heavy approach. Heavy smoketank effect in "Destruction of Cloud Cuckoo Land" sequence of "The Lego Movie"
We also embarked on a series of photographic investigations of real Lego under various lighting conditions. The Art Department had been making Lego models of vehicles and buildings, and we took these out of the studio early one sunny morning and arranged them into streetscapes, photographing them at various exposures and making High Dynamic Range (HDR) probes of the surrounding environment for future CG look development explorations. There was also a lot of photographic reference ranging from individual bricks to characters to sets photographed under various conditions of artificial and natural light, including studies of backlit elements and visible LED lightsources. We analyzed these studies closely to determine what "worked" visually, and this not only helped us formulate an approach to the lighting styles of the movie but also was informative for the Look Development team, led by Jean-Pascal le Blanc, as they worked on the Lego shader and surfacing. rather than allow the CG camera to pivot on a nodal point, rigs were built to emulate real-world camera rigs such as Steadicam rigs, albeit at a Lego minifig scale. This allowed for more "human" camera movement without the artificial perfection of normal CG camera work. a sense of weight and inertia was keyframed into the camera movement, again to seat the camerawork in the "real world" of the Lego sets, giving the audience the sense that the virtual camera had actual mass. imperfections were explored, such as deliberate overshoot of focus pulls and camera moves. With such a generally shallow depth of field it was found that overshooting DOF led to popping and was distracting, so the focus pulls were carefully and accurately done (sometimes frame by frame for very close camera work), but overshoots on camera moves were retained. Depth of field was set in Layout, and we inherited those DOF settings via the pipeline in Lighting, but DOF was ultimately implemented in our compositing stage. The DOF that Layout set was treated as "intent", but occasionally we would alter it as we observed how it worked with the lighting. 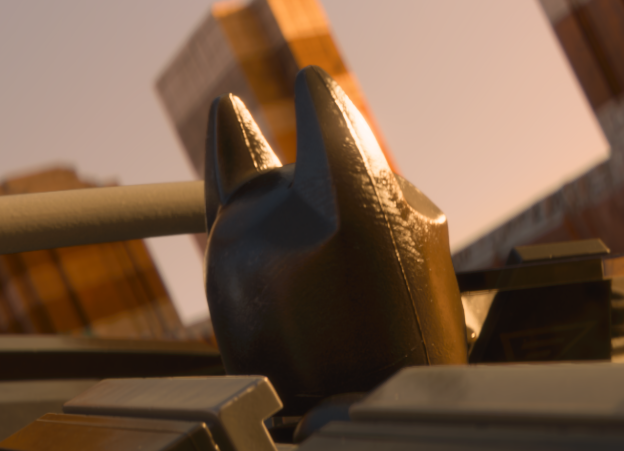 Part of finding a sense of the "epic" sometimes involved deepening the DOF (bearing in mind that Layout was setting the DOF without the benefit of fully shaded and lit renders). Also, the directors would sometimes ask for background action or scenery to be more sharply in focus to help sell a gag or to highlight some of the funny secondary animation that our superb team of animators had created. Floating motes of dust were also used as a nod to the real world but also to help the sense of scale. Occasionally a large hair will drift by, or motes that are relatively much larger than what you would see in a human scale movie would be caught in a beam of light. As a general rule, motes would be composited so they were only visible in light beams so they weren't distracting (we had several motes that seemed to be going for an Oscar that needed to be expunged from various shots). Characters and objects were covered in fingerprints, and exhibited wear and tear such as nicks and divots, all of which help to convince the viewer they are looking at real Lego pieces. The screengrab at the left shows how the placement of a fingerprint (on the side of Batman's head) subtly reinforces the scale of the world we are viewing (click to view larger). There are many shots in the film in the larger environments where our default lighting schemes did not do enough to give a sense of the epic to the shots. In these cases we artificially controlled the lighting falloff from the top of the environment to ground level, either using depth data to reduce exposure according to the height of objects in compositing or emulating this effect in mattepainting. This also helped action to play better in shots looking down - brightly lit foreground characters or props playing against a darker background. At ground level in these sets we used the same technique, often holding the sunlight off the ground and fading it off the buildings or canyons so the foreground action could play against that reduced exposure. Thou shalt not suffer a character to be frontally lit without a very good reason - this rule is designed to maximize the shaping of the characters via rimlighting and to utilize the subsurface scattering properties of the Lego plastic shader i.e. to allow light to scatter through the plastic for aesthetic reasons. Of course, there are inevitably times when characters will end up frontally lit, especially in very dynamic shots or where lighting continuity is critical, but in general we would choose beautiful lighting over strict continuity - it's more important to create and maintain a mood than to be too literal. Maintain Separation and ensure a good, clear read of the most important characters in a shot. This can be achieved via silhouette (for example staging against atmospherics, or by use of contrast), by colour or by judicious use of Depth of Field. Occasionally we would resort to a technique we call the "Shatner light", named for the cheesy technique of placing a bar of light over the eyes or face of Captain Kirk in the old Star Trek episodes - we always implemented this with a sense of fun on Lego, (though the technique was used with more serious intent on Legend of the Guardians). Clarity of action - with a lot of chaotic action scenes in the film we strove to allow a clear read of the important action, often utilizing the same techniques as for maintaining separation of the characters as described above, but also by directing the eye of the viewer via lighting gags, such as the spotlights from the helicopters in the freeway chase sequence. Shape and modelling, even of rectilinear or trapezoidal objects or characters. These could pose a real challenge (e.g. the Unikitty character who is pretty much all cubes). Sometimes we had to artificially enhance the light coming from one direction to get variation, or control the separate components of one or more lights in compositing, to reduce reflections off a planar surface at certain angles, for example. In general, the dominant lightsource in a shot would be placed to provide interesting shape and shadow, being mindful of but not shackled by continuity. Allow overexposure - we used overexposure to sell the notion that we were actually exposing film photographically. Sometimes the overexposure is only evident in hot specular "pings" of light, but still helps convey that bright light is reflecting realistically. Keep an eye on density - make sure nothing in the frame drops off to complete black and have enough range for grading work in the digital intermediate stage. Enhanced photorealism - we wanted a convincing simulation of photorealism, but we used every trick in the book to treat that as a point of departure rather than a limitation. We departed from strict physically correct DOF when required, used special lights that only affected certain objects or characters in a way that could not be done with real world lighting, utilized AOVs (Arbitrary Output Variables, output as part of our rendering process) that allowed us to manipulate lights in our compositing software (or even subcomponents of individual lights, such as the diffuse, specular, scatter or indirect contribution) or to work with other data such as normals or depth, for example to reduce the exposure of distracting areas of a set. Standard outputs for a shot included "grademattes" that allowed targeted grading work in the DI (digital intermediate) process - for example we could enhance a particular character in DI, or increase contrast of the face decals of a character for better clarity. It's one thing to light for action in a Lego movie, but quite another to light for drama and emotion. Our characters have trapezoid bodies and cylindrical heads - the flat planes of the bodies reflect light at the camera inconveniently, creating distracting flashes, while the heads model light without subtlety or nuance. The ability to isolate components of light striking the characters allowed us to remove light that interfered with performance or was generally annoying. For instance, it was a general rule to remove bright specular highlights from the characters' faces if it played over the animating face decals. We could also choose to remove or reduce a light reflecting off a plane at certain angles to avoid distracting flashing. Colour Pipeline Lead and compositor Alex Fry created a LegoLens kit for use in our compositing software, Nuke, where lens effects could be applied and controlled. Lens Breathing - a way to simulate the distortions over time introduced during focus pulls. Looked cool at times, though we frequently disabled it when it altered our framing away from the Layout intent. Flares were also added to images, sometimes using plugins in Nuke or elements created in other software but more often added in DI. The flares were either added for reasons of photographic fidelity e.g. to emulate what happens when a bright LED light source is visible in the framing of a shot with an anamorphic lens (such as the cliched anamorphic flares that J.J. Abrams actually apologized for over-using all over the place in his movies), or to contribute to dramatic reveals in a thematic sense, for example in the reveals of Wildstyle/Lucy where a playful visual sense of the ridiculous coupled with a musical motif underscored a recurring gag. Or, of course, when they looked cool. Action sequences in The Lego Movie tend to have a lot of chaos from which it is essential to isolate and highlight the critical action so the audience doesn't lose the flow of the drama. Our approach to solving this relies on application of our Lighting Principles, the main point being to separate the hero action from the visual and kinetic chaos of the background. The Lego Movie had sets that required the implementation of thousands of "practical" lights, emulating the placement by an extremely patient stop-motion animator of m﻿any﻿ individual LED lights in a real Lego set. Contractually I can't say much about how we went about this, except that we decided early on that it would be a bad idea to place each of these lights individually (because it would take a very long time). Suffice to say we developed a system that automated the placement of lights in nominated parts of sets, in vehicles and other props, and also a system that populated FX brick clouds with "LEDs" inside individual bricks or clumps of bricks, to internally light explosions, for example. This, coupled with the development of new render technology, made complex lighting schemes not only feasible but efficient. ﻿Many of our shots rely heavily on Mattepainting for their effectiveness, and I have to acknowledge the outstanding contribution of Dudley Birch and his crew of talented mattepainters to the visual success of The Lego Movie. Mattepainting on The Lego Movie was no simple task involving "painted" backgrounds, but often involved intricate sets made from tens of thousands of Lego bricks with a whole suite of techniques applied to them, often rendered with as much or more difficulty than the larger scale lighting scenes. Kudos also to Grant Freckelton, whose laser eye and visual direction really sealed the success of these mattepainting elements and who often contributed sections of mattepainting himself. One of the great challenges in constructing these shots was integrating mattepainted elements with those rendered in Lighting, a task that our highly proficient compositors and lighters rose to superbly.